Chris Looney - Siegmund Excavation & Construction, Inc.
Chris Looney is the newest member of the Allied Rock crew, but he came to us in February with years of experience under his belt. Chris started running equipment young in life, working on his Aunt and Uncle’s alfalfa farm in Christmas Valley, Oregon during the summers. After he turned 18, he went to work running shovel and forwarder for his Grandpa. Since then, Chris has worked for several different companies, doing everything from setting chokers, to running harvesters to working in a machine shop to pulling green chain. In the midst of all that, he got his mining experience working for Knife River. There he started out running a dredge, then moved on to operating crushers and running front end loader. After a few years of mining, Chris decided to go back to logging because he missed the woods. 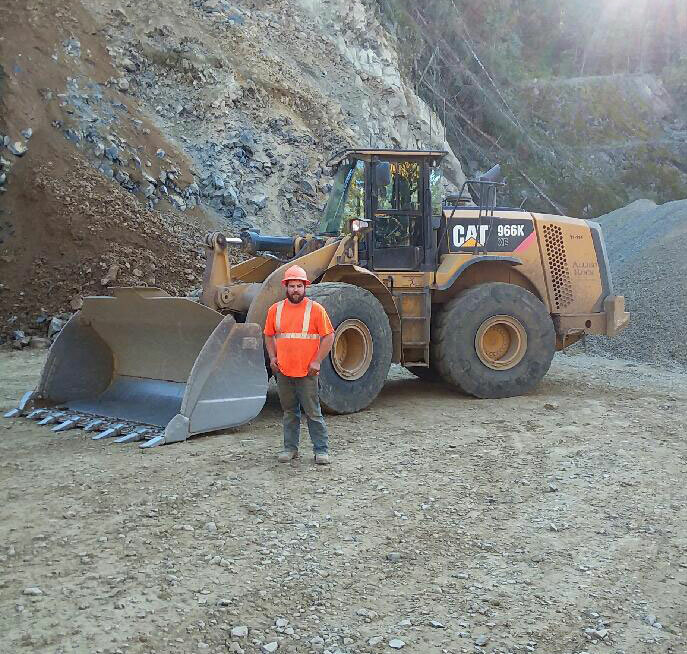 This year, he joined the Allied Rock portable crushing team so that he could have the best of both worlds; breaking rock and working in the woods. As a kid, Chris played football and basketball until his sophomore year in high school. That was when hunting, steelhead fishing, 4-wheeling, and well, girls became priority over sports. Now Chris spends his weekends and days off with his wife, Danielle and their four daughters, Kaylee, Madison, Rylee and Avery. When he’s not coaching softball in the spring or watching the girls cheer in the fall, Chris and his family spend as much of their time as possible in the woods or fishing. When he gets the chance to do things on his own, Chris says he likes to ride dirt bikes, hunt, fish, or crack a few cold ones with his buddies.